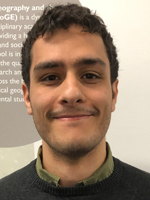 Iqbal is a first year DPhil student funded by the Rhodes Trust. He has a MSc in Ecology, Evolution and Conservation from Imperial College London, and a BSc in Zoology and Biochemistry from St. Xaviers College, Mumbai. Iqbal’s project is aiming to investigate the habitat requirements and economic value of insectivorous bats in rice fields in Assam, India. Insectivorous bats have an enormous potential to control insect pests, and in doing so reduce the need for the application of insecticide without sacrificing crop yield. Past studies have indicated that even single species interactions can save thousands of tons of rice per year. Iqbal’s current project involves estimating the value of the pest control service provided by a set list of insectivorous bats on rice pests such as planthoppers and leafhoppers, and also identifying the landscape characteristics that most influence the distribution of said species in a rice dominated landscape. The project will involve a combination of field work, diet analysis, and modelling.